In the early 1990s, William Robinson paintings were hot property indeed. His regular exhibitions at the Ray Hughes Gallery sold out quickly; so much so that Ray broke with convention and rather than have red dots to indicate sold works he would have no dots at all, and took great delight in answering queries from prospective buyers with a ‘no you can’t, they are all sold’. At around this time I was talking to James Fairfax about Robinson’s work and asked him why he had not acquired one of his paintings. He responded that he had simply not yet found the right picture. The hype around Robinson and leap-frogging prices were not a concern to the connoisseur. Patience prevailed and in Robinson’s 1996 exhibition James Fairfax finally found ‘the right picture’. In 1995, James Fairfax gifted John Olsen’s magnificent painting, We are all but Toys of the Mind, 1965 to the National Gallery of Australia. Robinson’s similarly sized Morning Springbrook and West, 1995 took its place and has hung in the hall stairway at Retford Park ever since. It is by any measure an outstanding example of Robinson’s work. The view that Robinson depicts is a panoramic vision which spans millennia. The title of the picture directs the viewer from Springbrook in the north of the Gold Coast hinterland, over granite cliffs toward the west. The breadth of the subject allows the artist to flaunt his skills as a colourist and again he uses his distinctive device of multiple view points within the one picture plain. He also employs vastly different techniques when applying the paint in the major passages of the painting. The meditative application of deep greens and granite greys in much of the composition is used by the artist specifically to depict the ancient features of the landscape and evoke its timeless quality. In the lower half of the painting, Robinson deploys upbeat staccato brushwork, which brings a present day contemporary feel to the picture. 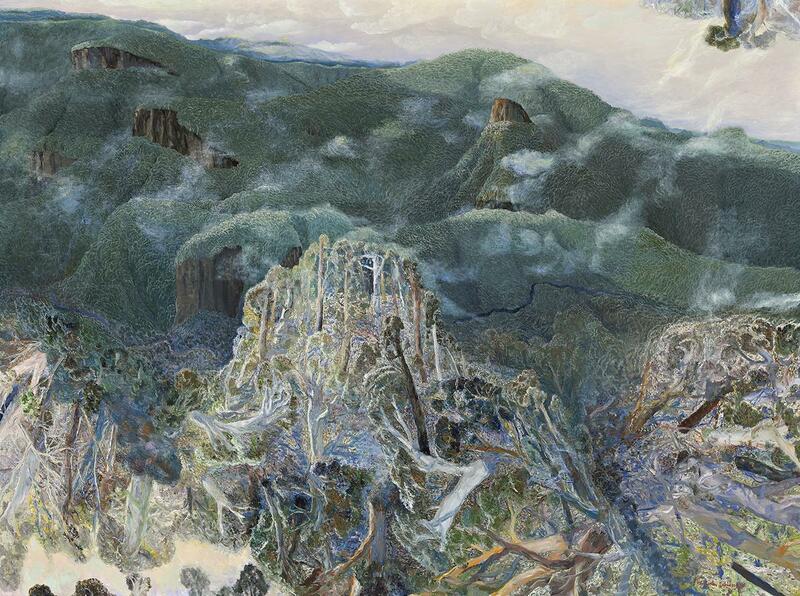 The forest of Antarctic beech trees depicted, within the time frame and context of the painting, amount to new growth and the floating clouds passing amongst the hills introduce an ephemeral element to the work, which further presses the notion of time passing.